Last week, an article co-authored by Dr. Justine Allen appeared in the scientific journal The American Naturalist. Dr. Allen received her Ph.D. from Brown University in 2014, completing her graduate work under Professor Roger Hanlon at the Marine Biological Laboratory in Woods Hole, MA. The article describes the behaviors of two male cuttlefish fighting over a female mate, behaviors that were recorded on video and in photographs taken by the authors while on a dive off the coast of Turkey. The video has since been seen tens of thousands of times, demonstrating the impact of research through the preservation and sharing of data. 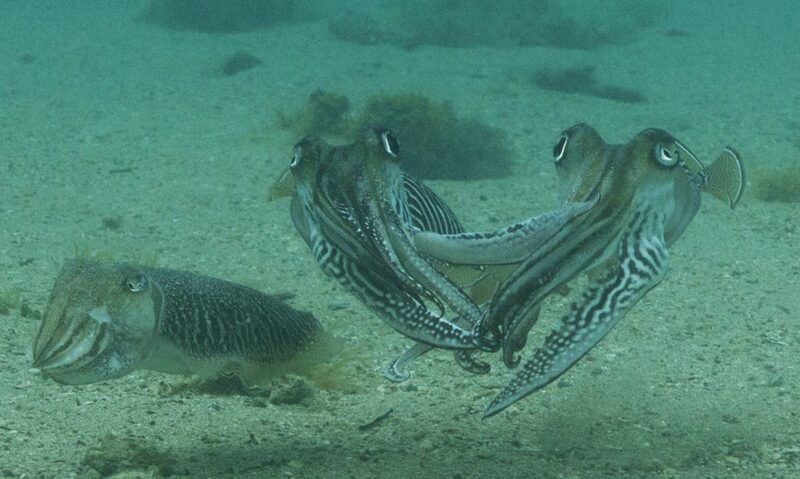 Akkaynak, Derya, and Allen, Justine J., “Dramatic fighting by male cuttlefish for a female mate” (2011). Data for Publications. Brown Digital Repository. Brown University Library.https://doi.org/10.7301/Z0PR7SX4. In order to analyze the recorded behaviors, the researchers created a scoring guide to document the types and characteristics of the organisms involved and their actions and the duration of the actions at certain timestamps in the film footage and on each still image. Before Dr. Allen and her co-authors submitted their manuscript for peer review and publication, they reached out to Hope Lappen, Biomedical and Life Sciences Librarian, and Andrew Creamer, Scientific Data Management Librarian, to get help with their questions about copyright and licenses for publishing and distributing their data, and for assistance with curating and depositing the files (the video, images, and analysis data underlying their paper’s findings) into an online collection in the Library’s Brown Digital Repository (BDR). The BDR is the Library’s platform for making digital collections available online. The BDR has a collection called “Data for Publications,” which is an online gallery for Brown researchers to preserve the supplementary materials accompanying their published articles or the data underlying their results and conclusions. The BDR also allows researchers to cite these materials and data in their publications and to make these files available to other researchers and the public online. Andrew worked with Ann Caldwell, the Library’s Metadata Librarian and Head of Digital Production Services, to plan out the descriptive information for each catalog record associated with their data set and the minimum documentation necessary to interpret the data. This process is iterative and involves collaborating with the authors to collect these details and create their records in the BDR with the aim of facilitating search, discovery, access, and citation of these materials online. Ann’s staff also helped to convert the film and image file formats into ones that are appropriate for long-term preservation. Upon deposit of the files in the Library’s BDR, Andrew and Ann work with Joseph Rhoads, the BDR’s Manager, and Ben Cail, the BDR’s programmer, to display the files according to the wishes of the researchers. For the cuttlefish paper, the authors wanted to be able to not only preserve the original video and image files in the BDR, but also to stream the video so that readers could view the video from its record the BDR. After files are uploaded, Joseph and Ben provide the researchers with a URL and a unique identifier, called a digital object identifier (DOI), that they can use to cite these materials within their article so that reviewers of their paper or interested readers can have access to them. By depositing the data in the BDR and citing the data within the paper, the authors allow readers to learn more about the science and judge the rigor and validity of their published findings. This transparency can help move science forward. So what is the big deal about making these materials public? In short, the answer is impact. Scientists want to spread knowledge and know that their research can resonate with the public. By depositing their video with the Library and citing and sharing their video, Dr. Allen and her co-authors were able to reach more people than they would have through the publication of their article alone. How many more people? One week after publication of the article, their cuttlefish video had been viewed by over 140,000 people online! In addition, the video had been reported on the websites and social media feeds of the New York Times, National Geographic, and Science and reported on the websites and on the Facebook and Twitter and similar social media feeds of media outlets in several countries, including Germany’s Der Spiegel. These posts have been shared, liked, and retweeted by people fascinated with the dramatic events the research team captured on film. Dr. Allen and her co-authors are not alone. A team of Brown undergraduates led by Dean Adetunji, Associate Dean of the College for Undergraduate Research and Inclusive Science, have deposited the file of a video in the Library’s BDR on the science of seeing color that has also has had over 100,000 views. This year marks the 20th anniversary of the National Science Foundation including broader and societal impact among the review criteria it uses to evaluate grant proposals submitted by researchers. The Library’s BDR plays a crucial role in helping to preserve and disseminate the digital outputs of Brown’s research community, including their broader impact materials that they have created for educating students or the public about their research. Videos, images, software, and documents that could easily be lost after the publication of an article now get cataloged by the Library and put online and discovered, accessed, and cited by other researchers and the public. This entry was posted in Digital Projects, General Interest, New Resources & Services, Publications by Jennifer Braga. Bookmark the permalink.